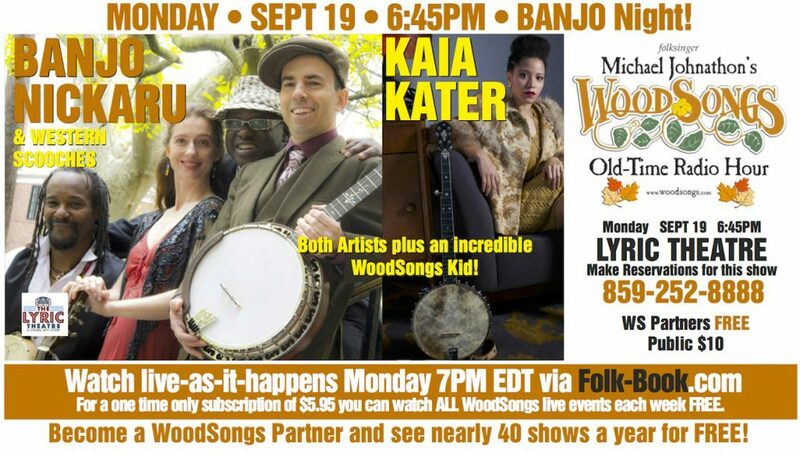 October of 2016 Banjo Nickaru & Western Scooches flew out to Lexington, Kentucky, traveling as a trio, to perform on the live taping of WoodSongs. WoodSongs is a worldwide multi-media celebration of grassroots, Americana music. Get ready to explore the beautiful world of folk, bluegrass, songwriting, new artists, literature, worldwide radio, television and concerts, hosted each Monday at 6:45 pm at the historic Lyric Theatre! Hear Kai Kater, a lovely brother sister team, and then Banjo Nickaru & Western Scooches as a trio with Nick Russo on banjo, Betina Hershey on vocals and guitar, and David Pleasant adding his Gullah-Geechee percussion.